We answer debt questions on the MoneySavingExpert forum every day, but how else can the forum help those in debt? We asked Fermi, one of the stars of the Debt-Free Wannabe board, to give his thoughts on the support the MSE forum members offer each other. For many people the desire to be free from the burden of debt is probably a daily and consuming issue. However, it’s also something that many (perhaps most) find it hard to confide and share with friends and family, which can result in it feeling a very, very lonely struggle. 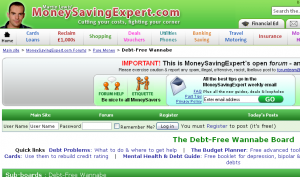 The Debt-Free Wannabe (DFW) board on the MoneySavingExpert (MSE) forum exists to try and breach that barrier: to provide a place where you can talk with others battling with the same issues; give and receive much needed emotional support; work through problems; encourage and help each other on your debt free journey; and much more. The MSE forum has over 900,000 users talking on many different subjects, each subject with its own mini-community. DFW is one of the busiest boards on the site, and currently contains over 70,000 individual threads and over 2 million posts. – Ask any and every question that might be causing you concern. Other DFWs will do their best to help, or you can also ask StepChange advisors a question on their dedicated Q&A thread. – Get involved in one or more of the many and varied challenges designed to help deal with your debts more quickly, budget better by making the most of what you have, and set achievable goals to aim for along the way. – Take part in some of the many other support threads on a wide range of topics, from coping in your debt management plan (DMP) right through to giving up smoking. – Start a diary thread to keep track of your journey, or give and receive encouragement along the way. – Post on the extra boards to help and support those going through bankruptcy, debt relief orders, individual voluntary arrangements (IVAs), or other similar more formal procedures to deal with their debts. However much you might decide to take part in DFW, everyone is truly welcome.